Cartoonist Mark Borgatta an American citizen living in Montreal produced this cartoon until he was called to the American Army for World War 2. The only one identified on t6he serial after Borgatta was André Kulbach although it is stated in Joke 23 that a Spragett took over the writing chores. Front: Illus., probably Marc L. Borgatta. Active Comics,19. Front: Illus., Adrian Dingle. Active Comics, 24. Front: Illus., Adrian Dingle. Active Comics, 27. “Dr. Blue and Blackie: Diamond Studded Shark.” Car., Marc L. Borgatta. Active Comics, 18: 1-7. “Dr. Blue and Blackie.” Car., Marc L. Borgatta. Active Comics, 19: 1-7. “Dr. Blue & Blackie: The Zoot-Suit Yokels?” Car., Marc Borgatta. Active Comics, 21: 1-7. “Dr. Blue & Blackie: The Pay-Dirt Pugs.” Car., Marc Borgatta. Active Comics, 22: 1-7. “Dr. Blue & Blackie: Mr K.” Car., Marc Borgatta. Active Comics, 23: 1-7. “Dr. 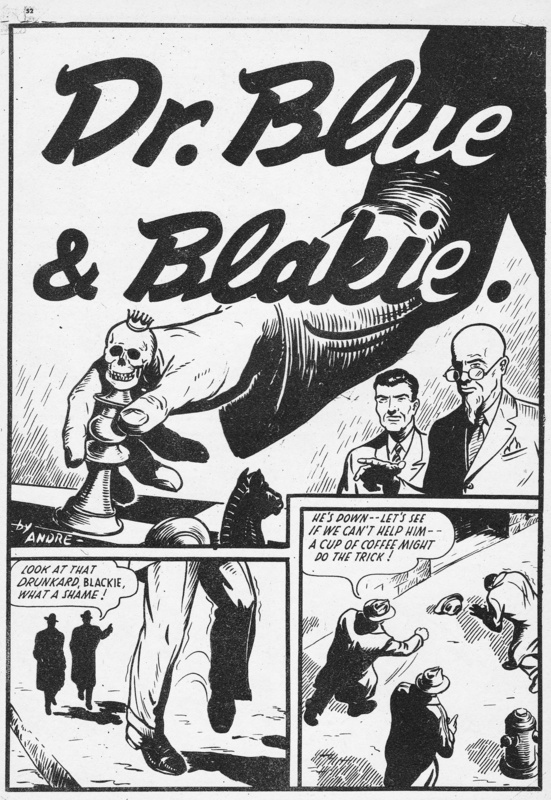 Blue & Blackie: Torgo The Jap Spy.” Car., unidentified Active Comics, 24: 1-8. “Dr. Blue and Blackie.” Car., unidentified. Active Comics, 25: 1-8. “Dr. Blue and Blackie.” Car., unidentified. Active Comics, 26: 1-6. “Dr. Blue & Blackie.” Car., André Kulbach. 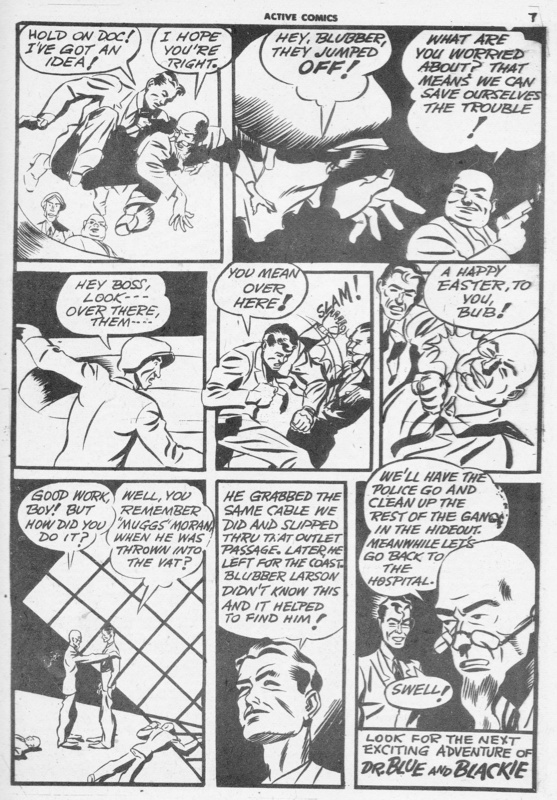 Active Comics, 27: 52-56..
“Welcome Home Gang.” Joke Comics, 23, no date : 26. Illus., Marc L. Borgatta. 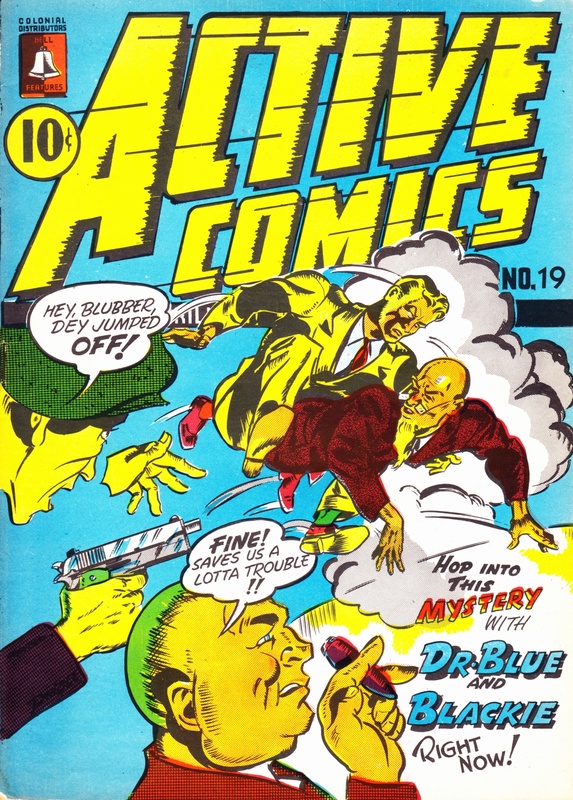 Active Comics, 19: Front cover. Car., Marc L. Borgatta. Active Comics, 19: 7. Car., André Kulbach. Active Comics, 27: 52.